1961 Fleer Baseball Greats marks the second straight attempt by Fleer to offer a set exclusively filled with former players. 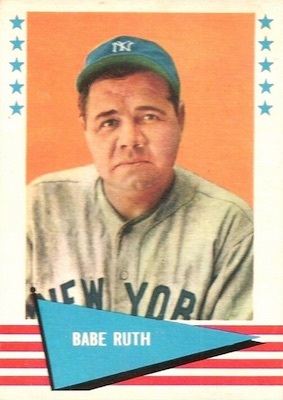 Like the the 1960 release, the '61 set was not well received by collectors upon release. 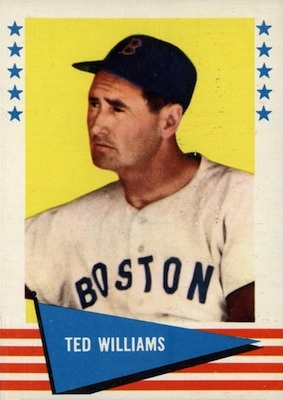 However, the updated design and larger checklist has made 1961 Fleer Baseball more popular over the years. Just like 1960 Fleer Baseball Greats, the 1961 Fleer Baseball set features players from multiple eras of professional baseball. In order to keep from violating Topps' exclusive player contracts, all the featured subjects are retired. Also like the previous year's set, there are several pictures that showcase subjects wearing street clothes or in Old Timer's Day uniforms. Issued in two series over consecutive years, 1961 Fleer Baseball contains cards #1-88, while the 1962 set covers cards #89 -154. 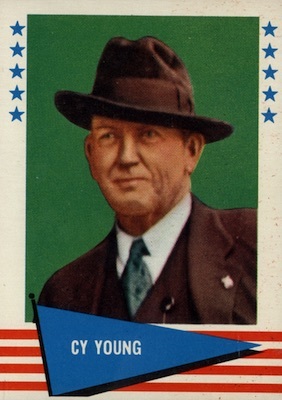 Each series begins with a checklist card showing multiple players on the front, and both series have subjects arranged in alphabetical order. Technically a 1961-62 set, most collectors still refer to it as a 1961 product. The first series is more common than the second release, so there is a slight premium for the high-number cards. 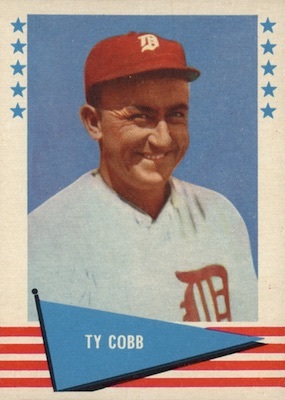 The 1961 Fleer Baseball card fronts feature a vertical orientation and a patriotic, flag-like design. 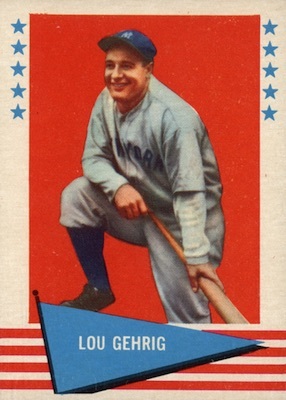 Cards display a line of five blue stars on either side of the player's image and a series of four red stripes across the bottom. 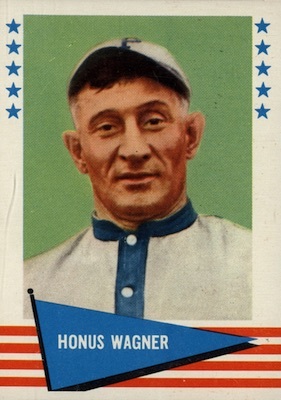 A blue pennant at the bottom contains the name of the player, manager or executive. Compared to the 1960 release, the 1961 cards are much more visually appealing. 1961 Fleer Baseball card backs utilize a horizontal layout and feature a trophy with the card number inside. More info is available via a basic biography and career write-up. A complete line of career statistics is also provided. 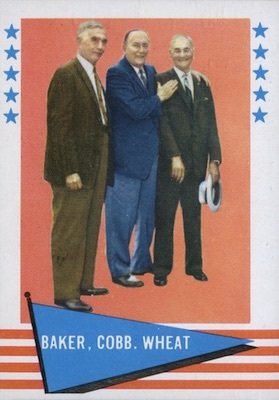 Ted Williams, Ty Cobb, Lou Gehrig and Babe Ruth anchor the 1961 Fleer Baseball set. 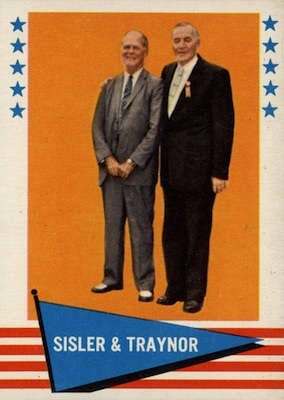 Other key cards in the release include the multi-player combo cards of Home Run Baker, Ty Cobb and Zach Wheat, as well as George Sisler and Pie Traynor. Both cards are also checklists for their respective series. 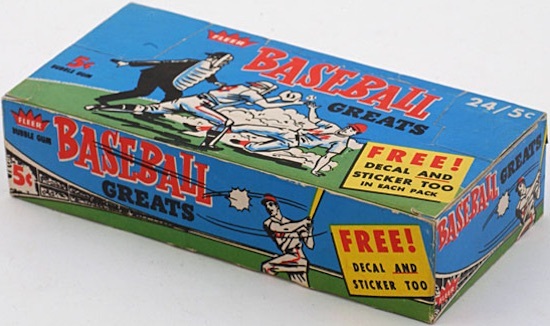 1961 Fleer Baseball cards were originally sold in five-cent packs and were packaged with two bonus inserts. Not numbered and fairly simple, each packs yields a logo decal for every team at the time and a pennant sticker that celebrates past World Series champions, from 1913 to 1960. The pennants inlcude both teams for the specific World Series year referenced, as well as the champion and the series win-loss result. 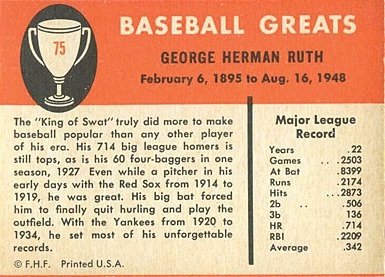 As with the 1960 set, the 1961 Fleer Baseball Greats card set has grown in popularity over the years. Loaded with Hall of Fame players from the vintage era, collectors have warmed to the affordable set. Common condition issues of the release include centering and edge wear, which is most noticeable on the card's reverse. 154 cards. Shop for base cards on eBay. 18 teams. 1 per pack. 48 cards. 1 per pack. First vintage set I ever worked to complete. I think it is one of the most beautiful sets from the era considering the restrictions face due to Topps contracts. Great design w/ fantastic list of players. In 1961, I bought one pack from this set. I decided not to continue, despite the advantage I thought the Fleer gum had over Topps. I considered the ’61 set to be pretty much the same as the ’60 set, but with different designs. I did continue with the Topps set. Added and traded players made the difference. Did they make a reprint of this series?